Each year, our students produce live hockey sportcasts for Charter Communication and Minnesota State University, Mankato using our high-definition production trailer. Members of this year’s hockey broadcast team have been hard at work preparing for the upcoming season. The season officially kicks off today, but work has been under way since the beginning of the school year. Led by senior producer Anthony Miller, there are approximately 20 students on this year’s team. The team prepared for the season with two practice broadcasts of Bethany Soccer in September. Later, students got involved with the creative side of sports broadcasting on Hockey Media Day. 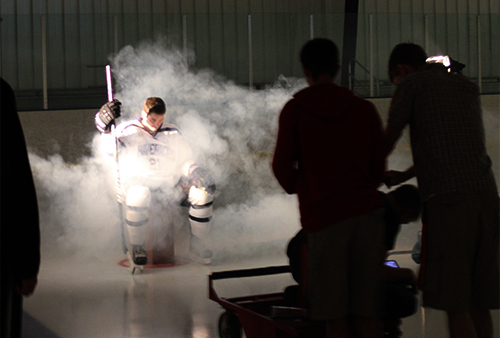 This is when our team has access to the players in full uniform on the ice. A good portion of the footage shot on this day is used throughout the season in edited packages and live game highlights. On October 6, the students took to the Verizon Wireless Center in downtown Mankato for their final practice broadcast as the Mavericks took on Lethbridge University in an exhibition game. MSU is poised for a big season on the ice and so is our broadcast crew. Tune into channel 826 on Charter to catch the action!